A winter wonderland became a frigid mess. A defensive struggle became a rout. A packed stadium became a ghost town long before the final gun. And an 11-game win streak became a dirty dozen. Behind three touchdown runs from quarterback Keenan Reynolds — the first tying the NCAA single-season record for QBs at 27, the last setting a new record at 29 — the Navy Midshipmen used a punishing ground game to hand the Army Black Knights a 34-7 loss Saturday at Philadelphia’s Lincoln Financial Field. 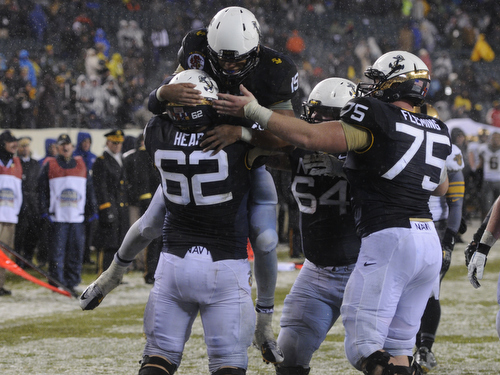 Navy hasn’t lost to Army since 2001 and now leads the all-time series 58-49-7. Reynolds, a sophomore, led the Mids to victory with a 30-carry, 136-yard performance. He also threw seven passes, completing two, for 10 yards; Army’s Angel Santiago added 50 yards in the air on a windy, cold afternoon — the lowest passing total all season in top-tier college football. The Midshipmen (8-4) rattled off 17 straight points in the first half, with second-quarter touchdown runs by Noah Copeland and Reynolds breaking what had been a defensive stalemate. Freshman Brendon Clements did the damage on defense for Navy, forcing a fumble in the early going and snaring the game’s only interception. Navy’s defense cracked only once, as Santiago led the Black Knights (3-9) on a third-quarter scoring drive keyed by a 29-yard pass to freshman Xavier Moss, who had all five of Army’s catches on the day. Santiago looked for Moss on the next play but couldn’t find him, instead scrambling for a 4-yard touchdown. Down just two scores with about six minutes to play in the third quarter, Army needed a quick stop to capitalize on its momentum. Instead, Reynolds led Navy on an 11-play, 51-yard march that ate up almost the entire quarter and ended with Nick Sloan’s second field goal of the day, a 34-yarder that made it 20-7. The Black Knights failed on a fourth-down conversion on their next drive and never got any closer. As snow turned into freezing rain and fans began bailing out, Reynolds capped off his Most Valuable Player performance with two more touchdown runs — an 11-yard scamper with 6:22 left to play (he caught a two-point conversion pass from Brendan Dudeck on a trick play afterward) and a 1-yard plunge on fourth down with 46 seconds left. A minor scuffle broke out in the end zone after the last score, and the remaining Army fans were less than pleased with Navy’s scoring drive, which included Dudeck considering another pass attempt on another trick play with the game well in hand. Sloan missed the extra point. Junior Terry Baggett led the Black Knights with 41 yards rushing, followed by Santiago’s 40. 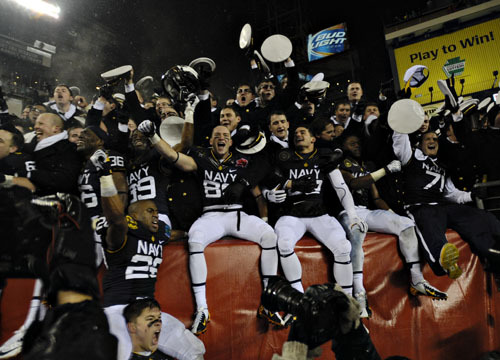 Navy outgained Army 353-207 and benefited from 50 yards in Army penalties. Navy will wrap up its season by facing Middle Tennessee State in the Bell Helicopter Armed Forces Bowl in Fort Worth, Texas, on Dec. 30. Army heads home for the year; head coach Rich Ellerson is now 0-5 against the Mids, and Saturday’s loss was the worst during his tenure. The series moves to Baltimore next year before returning to Philadelphia in 2015. Good job NAVY!! I am retired Army, my Dad was retired Navy! I love him more than I love my time in the Army and have always rooted for Navy!